Our Reflective Substation Signs are solvent screen printed with 3M solvent screen ink which is the ONLY process guaranteed by 3M. 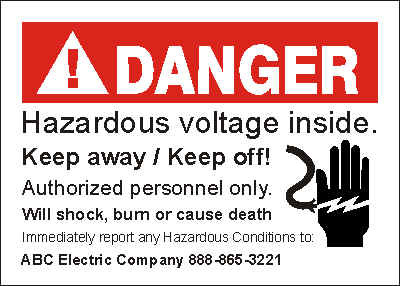 The signs are .032" aluminum laminated with 3M 3200 Engineer Grade Scotchlite. DANGER Hazardous voltage inside. Keep away/ Keep off! Screen printed with the best quality solvent based 3M inks - the only process guaranteed by 3M. CUSTOM PRODUCT ALLOW FOR 10 BUSSINESS DAYS TURNAROUND TIME. For custom message please contact us to order! NRECA Memebers recieve a 10% discount off these prices. Please mention when placing your order. 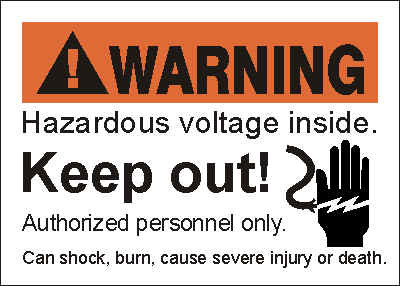 WARNING Hazardous voltage inside. Keep Out! cause severe injury or death.